My nephew Jeremy is a big Captain America fan. He is born and brought up in Amrika land. I find it difficult to catch up with his accent; so when he talks to me, he changes his accent and tries to speak to me in with an Indian touch. I, on the other hand try to add an American accent to my English and end up sounding like Rakhi Sawant. 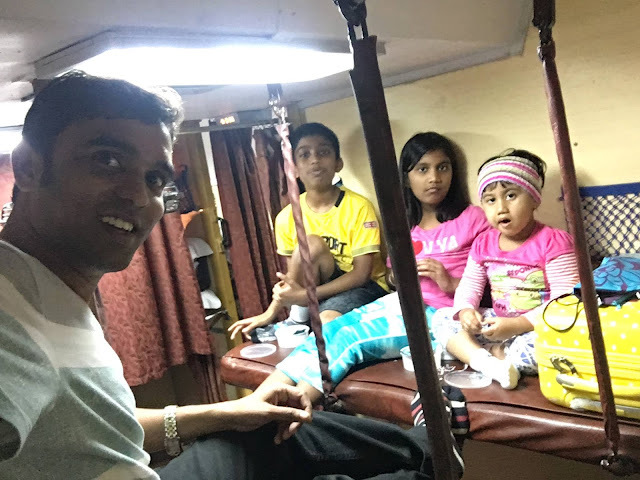 My nephew - Jeremy, niece -Jolena and my daughter Anya having a good time in the train. I know this photo is not related to this post. But I am adding here to let my readers know how Jeremy has grown. "So maamaa, Is there any Indian super hero you like?" "He is Gangadhaar with a mask"
"What is his super power?" "He can spin like a top and he can fly"
"But maamaa, Captain America can do all these stuff and he and Flash can also create tornadoes. Can Shakthimaan do all that?" " No Jer! I don't think so"
He was happy now. He had a sense of victory. He started jumping around the house thinking that there was not even a single Indian super hero who could match these American Superheroes. I let him jump around for some more time. "But Jer! There is an Indian super hero who is much powerful than Captain America"
"Do you mean to say that he can create tornadoes like Flash?" " He is a tornado himself"
His eyes widened and I could sense defeat in his body language for the first time. But still he had other questions in his mind. "What is his name Maamaa?" " He can jump, fly, do somersaults in midair, catch bullets with his teeth, bullets bounce back from his chest and kill the bad guys, He can singlehandedly destroy Pakistan terrorists, girls go crazy about him, he can give electric shock to the electric transformer"
"But that sounds like Chuck Norris"
"No No. We have an Indian super hero who is better than Chuck Norris. But I am not gonna talk about him here because I am his fan too." " Is Captain Vijaykanth really that good?" "Yes, he can also do yoga and if you misbehave with him, he will also say,"Thoo". So you better be careful." "Can I watch his movies?" We watched Narasimha, Virudhagiri and Arasaangam and Jeremy has finally accepted that Captain Vijaykanth is powerful than all the American Superheroes. We are going to watch Gajendra this week. Anyone care to join?